Home>Reviews>Components>USB 2.0 vs USB 3.0 vs USB 3.1: Which should you Have and Why? USB 2.0 vs USB 3.0 vs USB 3.1: Which should you Have and Why? The USB port has been an industry standard for connection in nearly every electronic device for decades. Sure, it’s not the most exciting thing in the world related to computers, but it is an important one. The USB port has gone through so many physical form factor changes along with different versions that it can be sometimes tough to differentiate between every single one of them. If we were to talk to about all types of USB ports ever made and every generation of USB, you’d probably close this article because of how long it would be. The purpose of this simple article is to inform you of different USB types, different generations, and how to add in USB more ports to your PC. So should you care about transfer speeds and power delivery throughout different generations? Depends on your use case. If you rarely connect external drives for transferring data, you can still get by with USB 2.0 for connecting your external devices. We can’t deny the increase in performance over generations and if you do transfer a large number of files using external storage devices, you would benefit from USB 3.0 and even 3.1 Gen2. Of course, 3.1 Gen2 will slowly become the standard in most computers sooner rather than later. Just another topic we want to quickly get out of the way is Thunderbolt 3. USB-C is a very versatile port. It can utilize USB 3.1 Gen1 and Gen2 alongside thunderbolt 3. Now, each of these protocols has bi-directional power delivery meaning any of them can be used to charge a laptop or power a display. There are obviously limitations to this with wattage alongside with power delivery. Now, let’s talk about USB-C. Thunderbolt 3 is a protocol, not a port so it’s often seen that a USB-C port with Gen2 support also works with Thunderbolt 3. It’s aptly called the one port to connect them all. Thunderbolt 3 is four times faster than USB 3.1 Gen2 maxing out at a whopping 40 gigabits/s (5GB/s or 5000MB/s). What can you do with that blazing speed? You can use it to connect an external graphics card, a 4k display and even charge your laptop. Even in simple transferring of data, it’s impressive. You can transfer a full 4k movie in under a minute. That’s seriously a massive improvement. Sadly, Thunderbolt 3 is still a rarity and taking its time to come to the mainstream market. 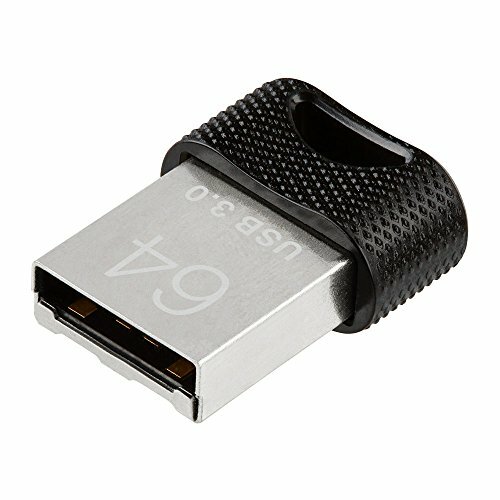 There are tonnes of different USB form factors out there. There are three main types. Type A, B, and C. Of course, these can be further broken down into even more ports such as micro-A or micro-B (typically used in phones). To make things simpler for us and the readers, we’ll be concerning ourselves with just the two important ones for PCs. Type-A is the port we are all familiar with. It’s the simple non-reversible rectangular port which we use to plug in everything from mice to speakers. It’s been an industry standard for decades in computers and other devices. It’s the port we are all used to in our everyday lives. Here’s something interesting for you. The USB-C port has been around for a while now, yet was popularized recently in 2015 by Apple. They made a bold move of removing all USB-A ports with a single USB-C port in their new Macbook redesign. Since then, we’ve seen USB-C ports rise up in popularity. USB-C is a new form factor that is an oval-shaped reversible connector, meaning it can be plugged in either way. It is tiny compared to USB-A. The main advantage here is that it is reversible and tiny so it can be used in nearly every device. Imagine a future where you just need one cable for all your devices. USB-C will lead the way to that future. USB-C also supports Thunderbolt 3 which we’ll discuss later on. If you’re interested in buying a new USB flash drive, look no further! A generation change in technology mostly means boosted performance. Same is the true for USB generations. There is USB 2.0, 3.0, 3.1 Gen1 and the latest 3.1 Gen2. As mentioned before the main difference is in terms of speed, let’s quickly run through all of them. USB 3.1 started making its appearance all the way back in January of 2013. This port is still not as common today. It was announced alongside the new Type-C form factor. First off let’s get some confusion out of the way. USB 3.0 and 3.1 Gen1 are both exactly the same ports. Same rate of transfer, power delivery, everything. 3.1 Gen1 is just a rebrand of 3.0. 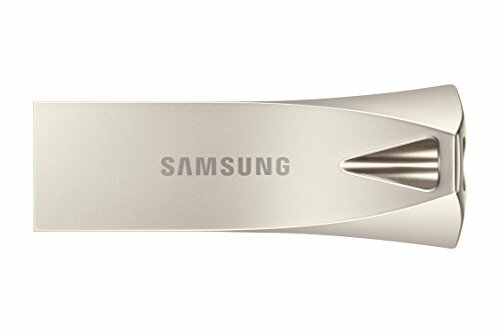 So, if you ever see a Gen1 port don’t get misguided as if its faster than USB 3.0. With that out of the way, let’s talk about Gen2. USB 3.1 Gen2 is twice as fast as USB 3.0 and 3.1 Gen1. The transfer speed roughly translates to 10 Gigabits/s (1.25GB/s or 1250MB/s). This is an impressive performance from a USB port considering most SATA SSDs can’t even utilize that speed to its maximum. Sadly, this is still taking its time to come to the mainstream market. We are seeing its rise in the laptop area so hopefully, more desktop motherboards will come out with this port. Every 3.1 port is backward compatible with 2.0 connectors. 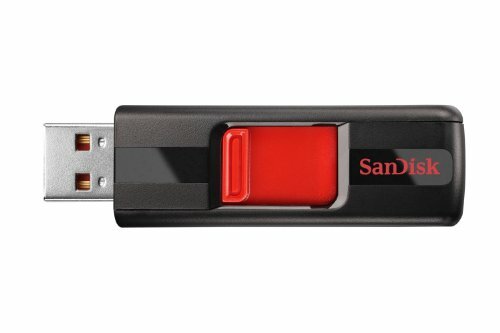 USB 2.0 is the most common version of the USB standard we use every day. The transfer rate is extremely slow, maxing out at 480 megabits/s (60MB/s). Of course, this is a bit slow for data transfer but for connecting peripherals such as keyboards, mice or headsets, the speed is sufficient. Slowly, USB 2.0 is being replaced by 3.0 in many high-end motherboards. USB 3.0 has gradually become the new standard for USB devices by providing a lot of improvements over USB 2.0. 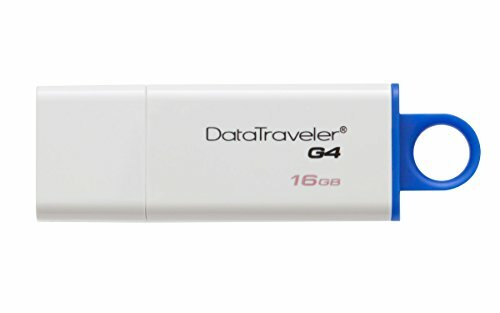 These types of USB are distinguishable by their blue colored inserts and usually equipped with a 3.0 logo. USB 3.0 is miles ahead of 2.0 maxing out at almost 5 megabits/s (625MB/s) which is over 10 times faster. This is quite impressive. So your old motherboard only supports USB 2.0. Don’t worry you don’t have to swap out your motherboard entirely just for one port. 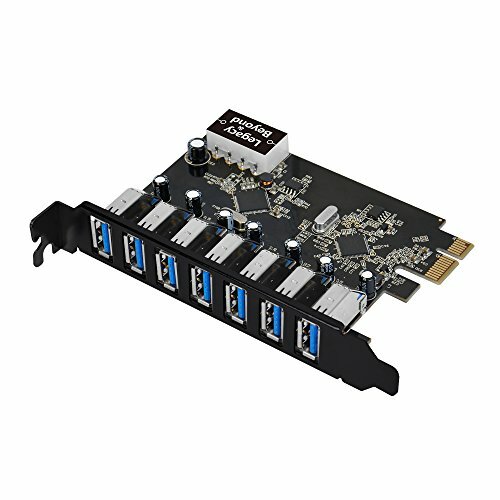 Simply pick up a PCIe USB adapter for your board and enjoy the versatility of Type-C or the speeds of USB 3.1. These plug into a PCIe port on your motherboard and usually use a Molex connection for power. 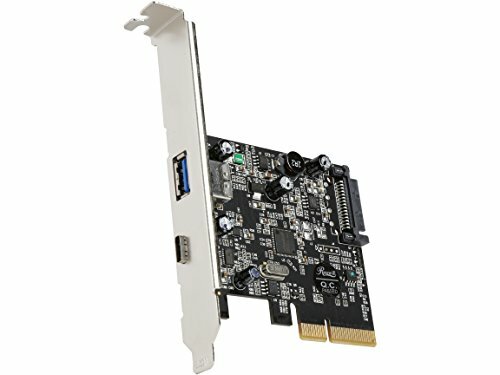 If you don’t need any fancy USB-C or Thunderbolt 3 support, then this is a simple no-nonsense PCIe adapter. It uses a Molex cable for power and has 7 USB 3.0 ports which run at the standard 5 gigabits/s (625 MB/s). It supports superspeed so it performs up to the standard of 3.0. Plug and play functionality is available on Windows 10, no drivers required. The only issue we found is that has some compatibility issues with a few motherboards. But when it’s up and running, it’s a neat little package that gives you 7 speedy 3.0 ports. All in all, this is a pretty neat and convenient package that adds 7 high-speed ports at the back of your PC. Assuming it is compatible with your motherboard, this is the only adapter card most people would need. If you own an LG1151 motherboard or an X99 one, this expansion card is the perfect thing to pair it up with. It includes a USB 3.1 Type-A port, A USB-C port that sports both USB 3.1 Gen2 and Thunderbolt 3 support. It even includes a DisplayPort 1.2. 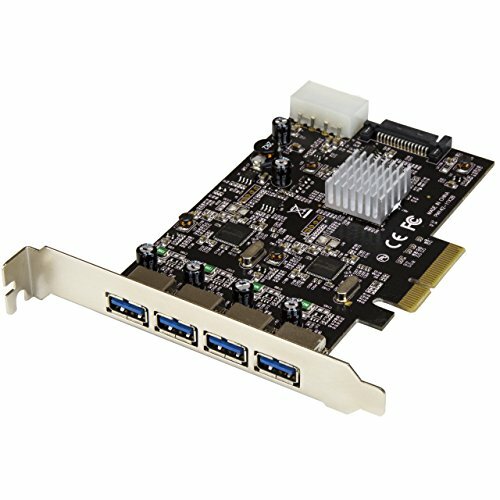 It connects simply using a PCIe x4 connection on the motherboard. It also supports charging 12V/3A output with 36W of support. 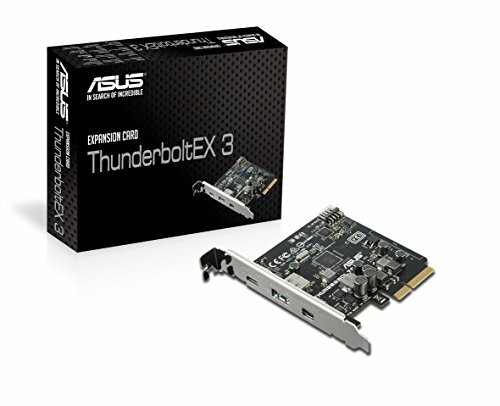 This seems like the perfect package to add a Thunderbolt 3 port to your motherboard. The added Type A 3.1 Gen2 port and Displayport 1.2 is just a bonus. The major issue here is that it’s only compatible with a few motherboards listed on the product page. If you do have a compatible motherboard this is a great pickup. If you don’t need USB-C but need a couple of speedy 3.1 Gen2 ports then this is the perfect add-on for your system. 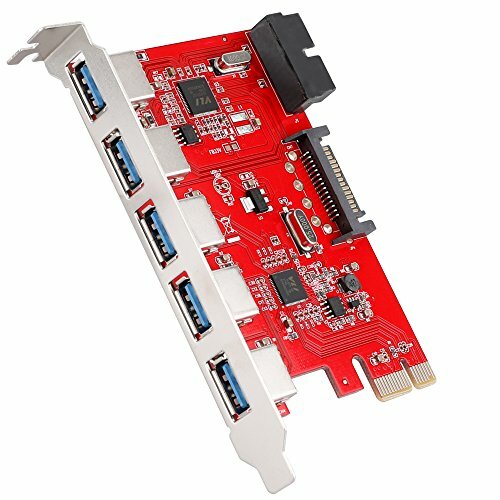 Just like every other card on this list it plugs in via PCIe and uses a Molex cable for power. SATA power is also optional for even faster performance. There really aren’t any compromises with this card. It’s a no-nonsense card that works as advertised. 3.0 Gen2 provides super fast performance as expected and overall this is an easy recommendation albeit at a higher price than others. That is to be expected as this is a 3.1 Gen2 card. This is as simple as it gets. All this Rosewill card does is add a USB 3.0 Gen2 port along with a Gen2 USB-C port. It doesn’t add Thunderbolt support or anything fancy. It’s a basic card just with a Type-A and Type-C port. It is powered only through the PCIe port and Molex cable. The only cons we can find with this card is the limited ports. Apart from that, this works as advertised and is a great basic card just for adding a Type-C port with Gen2 speeds. Last up on our list is a solid budget option. It has plug and play functionality that works with Windows XP-10. This sports 5 Type-A 3.0 ports. It can add up to 7 ports with an extension of 2 ports that can be added to the front of the case. It is powered through Molex and plugs into a PCIe slot on your motherboard. Overall, this is a great value option and we definitely recommend it for a simple upgrade to 5 USB 3.0 ports.